Mucinex is a brand name form of the generic medication guaifenesin. It is available in tablet or capsule form, as an elixir, syrup, or as a solution; it is also available in extended or regular release varieties and by prescription or over the counter. This medication is a cough expectorant, which means it works by thinning out mucous in the lungs to create a more productive cough, thereby relieving congestion. 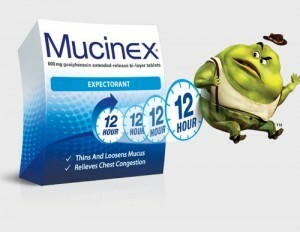 Mucinex also inhibits the cough response that occurs in the brain, thus providing relief from incessant coughing. 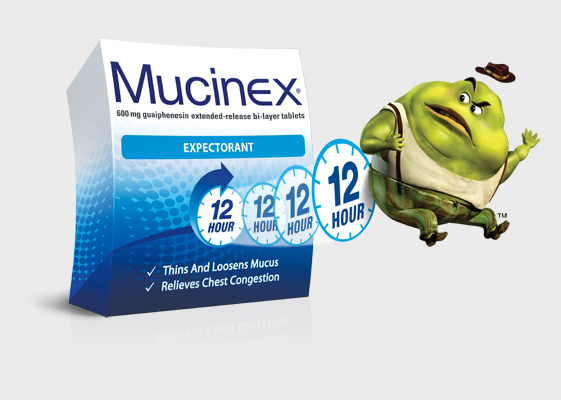 Mucinex is a medication used to relieve the coughing and congestion typically associated with a common cold and respiratory infections. It works to loosen mucus and secretions located in the passageways of the throat and chest to induce a more productive cough, this results in a lessening of congestion in these areas. This medication is not suitable for treating the long term coughing conditions associated with bronchitis or emphysema. Mucinex is available in a regular acting (short) release form, or in a longer acting form (extended release); extended release is offered in capsule or tablet form while the regular acting type is available in a pill or syrup. Both types should be taken with a full glass of water to help loosen mucus in the chest and throat; tablets should not be chewed, cut or crushed unless there is a dividing line on the pill, when a line is present the pill may be cut in half. Capsules can be taken whole or opened to sprinkle the contents on food. Dosage amounts for regular (short acting) Mucinex is 200-400 milligrams every four hours and dosing for the long acting version is 600-1200 milligrams every 12 hours. If recommended dosage amounts are exceeded there is a risk for overdose; an overdose of Mucinex can result in a coma or respiratory depression. This medication can also impair reactions and thinking making it important to use caution when operating machinery or motor vehicles. The brand name of the generic antiviral drug oseltamivir, Tamiflu has been used worldwide since 1999 but didn’t see widespread use until the H1N1 pandemic of 2009. NyQuil is a brand name medication produced by Vicks, and it can be purchased over the counter to provide relief for many symptoms of the common cold or flu. DayQuil is a medicine made by Vicks, and it is intended to relieve the symptoms of the flu and common cold.